House ownership in Spain is above 80%. The desire to own one's own home was encouraged by governments in the 1960s and '70s, and has thus become part of the Spanish psyche. In addition, tax regulation encourages ownership: 15% of mortgage payments are deductible from personal income taxes. Further, the oldest apartments are controlled by non-inflation-adjusted rent-controls and eviction is slow, thereby discouraging renting. Banks offered 40-year and, more recently, 50-year mortgages. As feared, when the speculative bubble popped, Spain became one of the worst affected countries. According to eurostat, over the June 2007-June 2008 period, Spain has been the European country with the sharpest plunge in construction rates. In 2008, new constructions came virtually to a halt, but prices were initially relatively stable with sellers reluctant to offer large discounts. The national average price as of late 2008 was 2,095 euros/m2 Actual sales over the July 2007-June 2008 period were down an average 25.3% (with the lion's share of the loss arguably happening in the 2008 tract of this period). Some regions have been more affected than others (Catalonia was ahead in this regard with a 42.2% sales plunge while sparsely populated regions like Extremadura were down a mere 1.7% over the same period). Unlike much of the United States, Spain does not recognize mortgage loans as nonrecourse debt. Since property prices dropped enough for most foreclosures to only account for 60% of the loan, those evicted have large debts for property they no longer own. 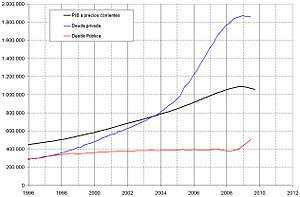 According to the reports of the Bank of Spain, between 1976 and 2003, the price of housing in Spain has doubled in real terms, which means, in nominal terms, a multiplication by 16. In the period of 1997—2006, the price of housing in Spain had risen about 150% in nominal terms, equivalent to 100% growth in real terms. It is stated that from 2000 to 2009, 5 million new housing units had been added to the existing stock of 20 million. In 2008, the real estate market started to drop fast, and house prices decreased dramatically by 8% in that year. In the period of 2007-2013, Spanish house prices had fallen by 37%. Each year almost a million homes were built in Spain, more than in Germany, France, and England altogether. The housing bubble was fed by the credit to private sector (individuals and developers), which led to a significant increase in private debt (blue) stopped with the international financial crisis, ending the speculative process. One of the main effects of this situation is the growth of household debt. Since usually the purchase of housing, whether to live or to invest, is made from mortgage loans, the price increase implies an increase in debt. The indebtedness of the Spanish tripled in less than ten years. In 1986, debt represented 34% of disposable income, in 1997 it rose to 52%, and in 2005 it came to 105%. In 2006, a quarter of the population was indebted with maturities of more than 15 years. From 1990 to 2004, the average length of mortgages increased from 12 to 25 years. The Bank of Spain reported that household savings in 2006 has been overwhelmed by debt. In fact, the Bank of Spain has warned each year about the high indebtedness of Spanish households, which according to the institution was unsustainable. The private debt stood at 832.289 billion euros at the end of 2006, an increase of 18.53% year-on-year, and reached 1 trillion euros by the end of 2010. The Bank of Spain also warned on the excessive indebtedness of the construction industry. President of the Chambers of Commerce of Spain, Javier Gómez Navarro, said at an event organized by the Association of Financial Journalists, entities "never recover" 30% of the debt owed to the housing sector. According to the Bank of Spain, this debt amounted to 325,000 million euros as of December 2009 was 96.824 million in bad loans. The president of the Chambers regretted that the Spanish financial system did not admit the impact of the crisis on their assets, as well as the Bank of Spain, which affirmed that it was the responsibility of the whole financial sector: "In Spain, it was never wanted to recognize that the financial system was not in good shape, as this would have forced the banking sector to start re-capitalising policies. The goal of the state's policy has so far been to gain time, to start a mild bank recapitalisation, but time is now running out". 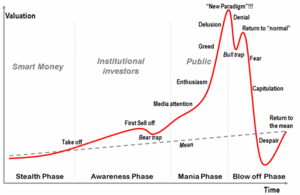 According to R.R. de Acuna & Asociados, a real-estate consulting firm, more than half of the country’s 67,000 developers can be categorized as “zombies”, having liabilities that exceed their assets and only enough income to repay the interest on their loans. According to the Bank of Spain, the rate of household doubtful loans among the total amount of credit increased from 0.8% in 2005 to 6.2% in 2011. 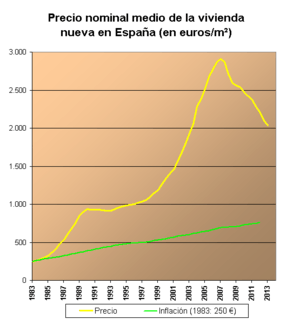 ↑ La burbuja inmobiliario-financiera en la coyuntura económica reciente (1985-1995). ISBN 978-84-323-0913-7. ↑ Azumendi, Eduardo (29 June 2009). "La otra burbuja inmobiliaria". El País (in Spanish). Grupo Prisa. Retrieved 3 November 2013. ↑ Rullan, Onofre; Artigues, Antoni A. (1 August 2008). "Estrategias para combatir el encarecimiento de la vivienda en España. ¿Construir más o intervenir en el parque existente?". REVISTA ELECTRÓNICA DE GEOGRAFÍA Y CIENCIAS SOCIALES (in Spanish). Universidad de Barcelona. XI (245): 28. ISSN 1138-9788. Retrieved 3 November 2013. ↑ Smyth, Sharon; Urban, Rob (2013-03-20). "Spanish Banks Cut Developers as Zombies Dying: Mortgages". Bloomberg. ↑ Expósito, Antonio A. (4 November 2005). "Todo lo que tienes que saber sobre los alquileres de renta antigua". jublio.es (in Spanish). Júbilo Comunicación, S.L. Archived from the original on 11 October 2007. Retrieved 3 November 2013. ↑ "Recent history of the Spanish residential property market". Global Property Guide. ↑ Hogan, Caelainn (14 November 2011). "Spanish property bubble fallout continues with evictions, debt and fear of homelessness". The Irish Times. Archived from the original on 14 November 2011. Retrieved 3 November 2013. ↑ "El tsunami urbanizador", pág 24 y sig. ↑ Diario El Mundo: El pago de deudas se 'comió' en 2006 todo el nuevo ahorro de las familias españolas. ↑ Año 2003: el Banco de España alerta..., Año 2004: el Banco de España alerta..., "Año 2006: el Banco de España alerta..."
↑ El Periódico de Aragón.